Rekeying the Locks – a less expensive, but in many cases, just as effective as replacing locks. This is a great option for someone who may have lost a key or recently bought a home. Check for Damaged Locks – We also suggest checking your locks for damage or needed maintenance. Often deadbolts that don’t fully extend are tell-tale signs that your locks need to be replaced and doors or keys that stick might need a bit of maintenance or complete replacement. These are some of the ways that our locksmiths can help you keep your home safe in The Woodlands. We can also help you stay safe when you hire us to not only assist you with required maintenance needs, but also when you are locked out and need us immediately. All of our locksmiths are licensed and insured giving proof that the person who is providing you with better security truly is because they are a person that can be trusted. We have over 13 years of experience and have the knowledge and tools to provide you with the best services. Call Affordable Locksmith of Texas for all your security needs in The Woodlands. There are ways beyond just changing the locks, installing electronic locking systems, and repairing broken locking systems. Here are some other ways to keep your home safe. 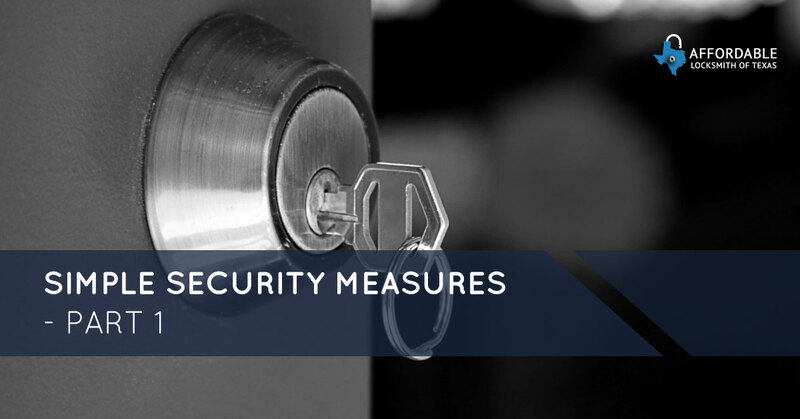 This may seem like an obvious suggestion that need not be mentioned in this blog post, but there are many who fail to lock their homes because they simply think they don’t need to. Locking your door, windows, garage, and even your balcony doors is a must. When burglars are looking for a home to break into they look for the easiest option and leaving your doors or windows unlocked is an open invitation. Lights on in a home are a natural deterrent for those will ill intent, even when there are no cars in the driveway. If you are going to be home late, turn on a light that will be on while you are away and when you get home not only giving the illusion that someone is home, but it will give you a clear view of your room so you can be sure you are entering a safe home. For more security tips, stay tuned for our next blog! And as always, Affordable Locksmith of Texas is here for you when you want to increase your security and when you find yourself locked out. Contact us today!